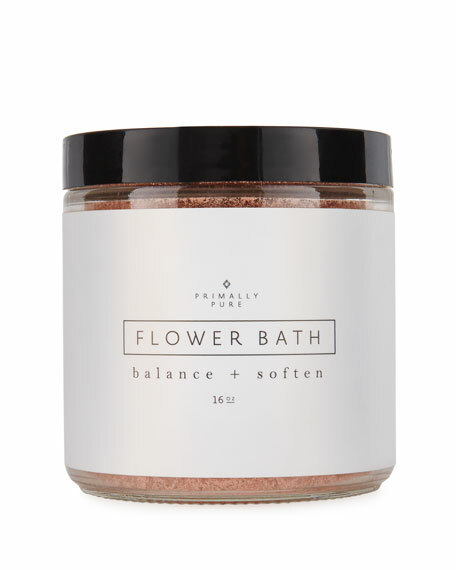 Primally Pure Flower Bath contains an aromatic and skin-softening blend of soothing botanicals that repair damaged/inflamed skin, balance pH levels, and detoxify the skin + body. Epsom salt is widely recognized for its ability to help rid the body of toxins and soothe sore muscles. Baking soda has an alkalizing effect on the body and works alongside dehydrated coconut milk to leave the skin feeling silky and smooth. Primally Pure Flower Bath is scented with organic essential oils of lavender (known as the most versatile of all essential oils in terms of healing the skin) and geranium (a deliciously fragrant oil known for its powerful skin regeneration properties). For in-store inquiries, use sku #2291004.